The South Haven Harbor Walk offers opportunity to explore Lake Michigan fisheries past and present. 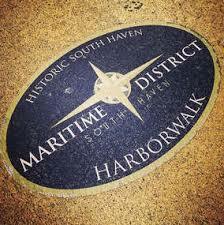 Explore the City of South Haven Maritime District - and a fisheries heritage experience - by way of the Harbor walk. Anchored by the Michigan Maritime Museum, which features an extensive Lake Michigan commercial fishing exhibit highlighting the 20th century fish tug the Evelyn S on campus. For those wishing to dive deeper into the local maritime heritage collections, the Marialyce Canonie Great Lakes Research library is also located within blocks of the museum. Bringing fisheries alive are many opportunities to enjoy Lake Michigan fisheries today from charter boat fishing opportunities to boat rides aboard a historic commercial fish tug, the Elsie J, owned and operated by the Jensen family. Finally, enjoy a flavor of the local fisheries from perch basket meals at local restaurants, such as Captain Lou's, to the annual fish boil hosted each Fall by the South Haven Steelheaders. Annual community fish boil sponsored by the South Haven Steelheaders, during South Haven Blueberry Festival. Research library specializing in Great Lakes maritime history and heritage. Evelyn S. still making history at the Michigan Maritime Museum offers visitors the chance to board the historic Great Lakes fish tug Evelyn S. and peer into the daily life of a commercial fisherman. Bob's is a local butcher offering a variety of meats, including seafood and locally smoked Great Lakes fish . Captain Lou's Boathouse and Grill offers several Great Lakes fish meals, including their famous perch baskets. Great Lakes Fisheries Heritage Trail article featuring Evelyn S, written by MSU Extension and Michigan Maritime Museum. Book featuring maritime heritage images and photos of South Haven 1900-1950.